The all new trailer teaser for the Follow up to the popular the Galaxy Of The Guardians has arrived and it looks great and funny. We cant wait to see more of little Baby Groot! WATCH THE TRALER BELOW! The half-human, half-alien leader of the Guardians of the Galaxy who was abducted from Earth as a child and raised by a group of alien thieves and smugglers called the Ravagers. Describing where Quill is at the start of the film, Pratt said, “he’s famous now in the galaxy for having saved so many people… He feels like he’s part of this group, a leader of this group. He’s a little more responsible and trying to stay out of trouble, but not necessarily doing the best job.” Pratt stated that working on the film forced him to come to terms with the death of his father. Pratt returns as part of a multi-film contract with Marvel. A member of the Guardians who is an orphan from an alien world who seeks redemption for her past crimes. She was trained by Thanos to be his personal assassin. Regarding Gamora’s relationship with Nebula, Saldana described it as “volatile” and added, “we’re starting somewhere very crazy but appropriate given where we had ended things off in the first” film. A member of the Guardians and warrior in search of vengeance against Thanos for killing his family. Bautista opted to wait for the final version of the script, rather than earlier drafts, in order to be surprised by the story and not take “away from the magic” or “put a damper on it”, which he felt happened when he read the script for the first film. A member of the Guardians who is a tree-like humanoid and the accomplice of Rocket. Diesel also provided Groot’s voice for sixteen foreign-language releases of the film, up from six in the first film. As Groot is smaller in the film than in the first, executive producer Jonathan Schwartz said, “He doesn’t have the wisdom and experience of that Groot. He’s a younger Groot and a more rambunctious Groot.” Schwartz also stated the film would examine if he was “the same Groot, just smaller? Or is he a different Groot that’s sprung up from the seed of the first Groot?” Diesel added that Groot now “couldn’t be more naive” and felt the Groot seen in the first film was “a college level Groot. He’s not fully grown yet, but he’s a man… now he has to start all over, so to speak. So we’re going to see this goofy, adorable, baby Groot thing running around the screen. Just kinda learning as he goes.” Regarding Groot’s previous memories, Marvel Studios president Kevin Feige added, “He remembers. 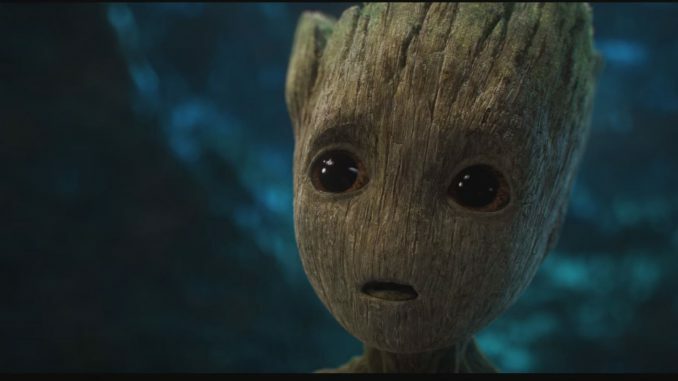 He’s not mentally a baby, he is still Groot… I sort of equate it to Spock circa the end of [Star Trek III: The Search for Spock] and [Star Trek IV: The Voyage Home].” As Groot only communicates with the phrase “I am Groot” in different inflections, James Gunn created a “Groot Version” of the script for himself and Diesel, which contains each of Groot’s lines in English. A blue-skinned buccaneer who is the leader of the Ravagers, a fatherly figure to Quill, and member of the Guardians. Yondu has a larger head fin in the film, bringing the character’s look closer to his comic counterpart. An adopted daughter of Thanos who was raised with Gamora as siblings, and a member of the Guardians. Despite being a member of the Guardians team, Gunn cautioned, “With Nebula, well, you never know what’s up with that one.” Gunn stated the production team may have figured out a way for Gillan not to have to shave her head for the role, unlike in the first film, which Gillan noted her appreciation in not having to do so. Gillan stated the film would further explore the sisterly relationship between Nebula and Gamora. Sean Gunn as Kraglin: Yondu’s first mate in the Ravagers. Glenn Close as Irani Rael: Supreme Commander of the Nova Corps, known as Nova Prime, whose mission is to protect the citizens of the Nova Empire and keep peace. A member of the Guardians with empathic powers who was raised by Ego. Schwartz said the character “has never really experienced social interaction”, and “learns about dealing with people” and “social intricacies” from the other Guardians. Elizabeth Debicki as Ayesha: The golden High Priestess and the leader of the Sovereign people, who enlists help of the Guardians. Kurt Russell as Ego: An ancient and mysterious cosmic being who is Quill’s father and raises Mantis. Ego does not appear in the film in his planetary form as in the comics, but instead assumes a humanoid guise. Considering Russell for the role was suggested to Gunn by Pratt, as Gunn did not have Russell “in [his] head initially” for the role. Ego was allowed to be used in the film after 20th Century Fox reached a deal with Marvel Studios to return the film rights of Ego for changing the power set of Negasonic Teenage Warhead, who Fox wanted to use in Deadpool (2016). Gunn, who originally thought Marvel held the rights to the character, stated that had the deal with Fox not been made, there was “no back up plan, and it would [have been] nearly impossible to just drop another character in” given the extensive work done surrounding the character. Additionally, Evan Jones, Jimmy Urine, Stephen Blackehart, Steve Agee, Mike Escamilla, Joe Fria and Terence Rosemore portray Wretch, Half-Nut, Brahl, Gef the Ravager, Scrote, Oblo, and Narblik, respectively, all members of the Ravagers. Tommy Flanagan and Don “Donny Arcade” Johnson also play members of the Ravagers. Sylvester Stallone has been cast as a Nova Corps member, while Stan Lee has a cameo appearance.